Newspapers in the UK will be “extinct” in their current form by 2019, according to predictions by futurist Ross Dawson. 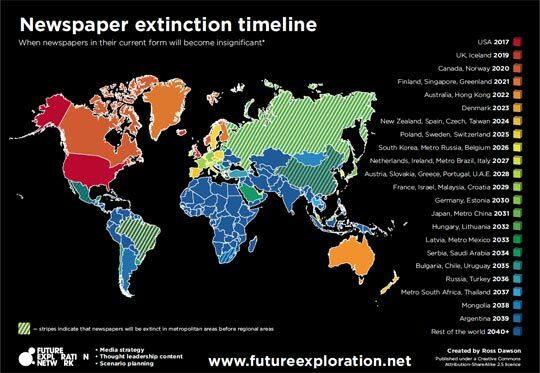 Earlier this week, Dawson has created a ‘Newspaper extinction timeline’, which suggests that while newspapers worldwide will exist in their current form beyond 2040, the US will be the first country to lose the printed paper in 2017. Factors driving the pace of newspaper extinction on a global scale, according to Dawson, include: changes in newsprint and production costs; increased cost performance of tablets and e-reader; and the development of high performance digital paper. On a national level he has taken economic, demographic, political and technological factors into consideration. More explanation is given on Dawson’s blog. What I like about Dawson’s nudge is that it reminds us that the clock is ticking. We can’t work fast enough at the corporate level or the industry level to develop digital platforms that connect with readers and advertisers. We can’t work fast enough to build multimedia companies where print, online, mobile, iPad and others each play to their strengths and interact. Just as we were warned in the 1990s that classified advertising could disappear and we need to prepare for that, we need to be preparing today for an all-digital future – whether that comes in 2025, 2050, 2100, or some year beyond the reach of our great-grandchildren. Here’s an interesting exercise for your management team: pick the date Dawson says your country’s newspapers will be “insignificant” and work backward. What would you need to do between today and that date to transform your business model and generate enough revenue to preserve today’s level of journalism at a sufficiently profitable level? We may all make similar choices, but my guess is the sense of urgency is more intense in the United States than India. This entry was posted in Job losses, Newspapers and tagged Earl Wilkinson, newspaper extinction timeline, Newspapers, Ross Dawson on November 3, 2010 by Laura Oliver.